April Fools Giveaway #1 - CLOSED! Speaking of dogs and humor, if you haven't met Hank the Cowdog you have no idea what you are missing out on. (But I am here to save the day! With all due respect to Hank, Head of Ranch Security, of course.) Hank is a lovable ranch dog who thinks much of himself and gets into all kinds of death defying shenanigans. Clean reading. Very funny. My sister-in-law graced us with a post about Hank the Cowdog sometime back (click on the link to read her thoughts and see how she threw a Hank the Cowdog birthday party for my nephew!) and I'm here to offer you your very own (gently used) copy of The Original Adventures of Hank the Cowdog. This is book one in the series and is merely meant to get you going on your journey with Hank, Drover, Pete, Slim, Roper and Sally May. To win? Simply leave a comment below! This contest is open to U.S. and Canadian residents and will be open through Thursday, April 7th. Good luck and may the best dog person win. My Grandson would love this book! They adore Dogs...we have 3! I posted this giveaway on my blog! 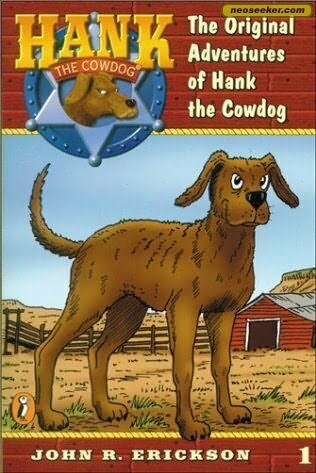 I remember Hank the Cow Dog. This would be fun to win. I'm about to like you on FB. Oooh, I would LOVE to win this for N1. She just devoured her first Hank the Cow Dog book (and it wasn't book 1 because that was checked out at the library). Fun! I think my son would really like this. I would love to win a copy of Hank the Cowdog! Several years ago my family and I listened to some of these stories on CD; they are fun. Yep, a good laugh would be perfect for April Fool's Day. OH! I hope I am randomly picked! This book sounds like so much fun! I am a Facebook Fan of your blog! They published some of this as a serial in our local paper awhile back. Super cute! I'd love to keep it around for a couple more years! already a fan on FB! My nephew would LOVE this book- he is an avid young reader. I was just telling Kyle that he could read Hank soon, so put our name in the hat! Thanks for the reminder that I need to check our library for the Hank the Cowdog audio books. They would be just right for my kids now! I remember listening to a few of the Hank the Cowdog series in audio version. They are fun! If you put a dog on the cover, I will read it. I have heard that the Hank books are awesome and I'd love to own one. Thanks! We brought home Hank after your review months ago (last year?). Will enjoys him. Then I found several Hank books at our library's used book sale last week. At $.20 each they came home with us!! Thanks for hosting all these giveaways! My youngest grandson would enjoy this!